Offering beautiful rooms at affordable prices, Central House is luxury on a budget. Built in the late 1800s, Central House has retained its historic charm, yet offers modern amenities to make your stay both enjoyable and comfortable. All rooms have king, queen or twin beds, and include A/C, private baths, wifi, and cable TV. There is a covered porch for watching the Bar Harbor world go by, getting lost in a book, or having an afternoon snack. 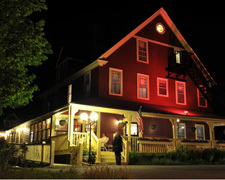 This a great spot for watching the passing of horse-drawn carriages, the colorful Bar Harbor scene, and even the Fourth of July parade. The sun porch has tables and chairs where you can play games or peruse local information. Here you will find coffee and tea around the clock, and you can bring your own wine and hors d’oeuvres, or breakfast from a local eatery. Ice machine, fridge, and microwave are available for guests to use.